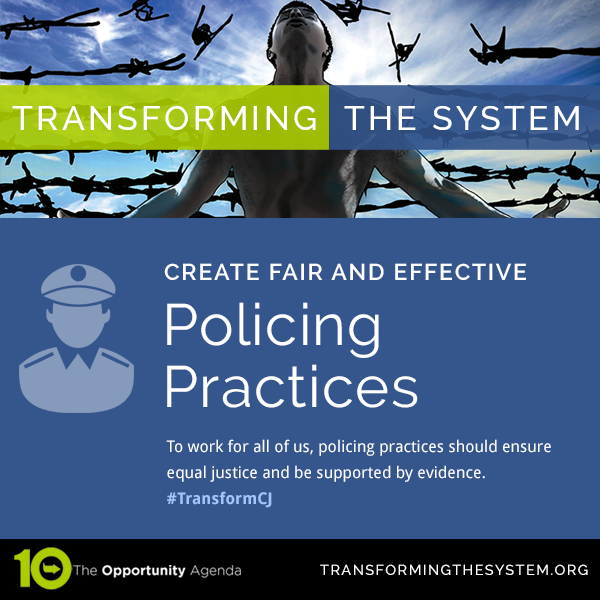 To work for all of us, policing practices should ensure equal justice and be supported by evidence. These practices should be rooted in human rights principles and recognize the importance of maintaining a good relationship between communities and police. Nonetheless, some police departments have a history of policing in inequitable ways that frequently alienate and actively harm low-income communities and communities of color. Some police departments rely upon practices that have questionable effectiveness at decreasing crime and proven effectiveness at alienating communities. 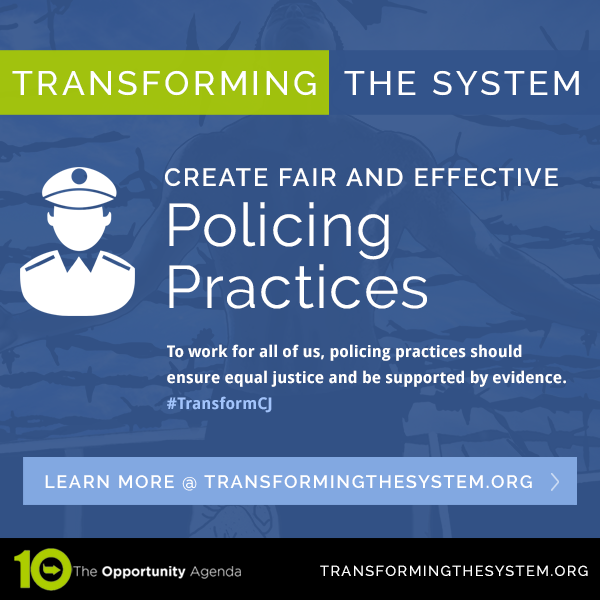 With the rise of the Movement for Black Lives and Black Lives Matter, and the spate of police-involved shootings, the need for police reforms that foster positive community and police relations is critical. Policing practices should not include nor allow for profiling, including profiling based on an individual’s perceived immigration status. This is particularly important because of the harsh consequences to immigrants involved in the criminal justice system. To address these issues, policing must have a clear commitment to human rights, adhere to the mandates of a national use of force guide, and promote accountability measures that include criminal and civil lawsuits, as well community accountability measures. Congress and/or the Department of Justice should issue a National Use of Force Handbook, which outlines recommendations that are consistent with constitutional and statutory obligations and the Police Executive Research Forum Use of Force Principles. Applicants for federal funds should be required, or encouraged, to comply with these guidelines in order to receive funding. To promote accountability, local, state, and county legislatures should pass legislation that requires police departments to pay half the amount of civil judgments that stem from police misconduct lawsuits. Where insurance companies pay for the civil judgments from police misconduct lawsuits, legislatures should allow insurance claims to seek compensation from police departments that should have known that the police officer(s) in question would use excessive force. Furthermore, legislatures should provide a negligent hiring cause of action against police departments for employing an officer who the department should have known is likely to engage in excessive force. State legislatures should pass legislation that “requires current and prospective police officers to undergo mandatory implicit racial bias testing, including testing for bias in shoot/don’t shoot decision-making, and develop a clear policy for considering an officer's level of racial bias in law enforcement certification, the hiring process, performance evaluations, and decisions about whether an officer should be deployed to communities of color.”1 Candidates for police officer positions should also be required to pass psychological testing that screens out candidates who display a proclivity for aggression and violence. Police departments should rely upon collaborative approaches that respect the dignity of individuals within the community; focus on problem-solving; and are generally more community-centered and build community trust. Tactics might include relying upon the use of structural and environment strategies to reduce crimes, such as adding lighting in hot spot areas, securing abandoned buildings, and building partnerships with community members to address specific crimes. The widespread and systematic use of increasing police-civilian encounters through stop, frisk, and questioning, misdemeanor arrests, tickets, and summonses for less serious offenses should be prohibited. Police departments should create early warning systems for detecting patterns of behavior, such as complaints filed against officers or personal hardships like divorce, which indicate potential vulnerabilities for the officer and the department. The primary purpose of such systems is not to punish but to provide counseling to officers so as to reduce their level of risk as well risk to residents and communities. Legislatures should require that police interrogations be electronically recorded "during the time in which a reasonable person in the subject’s position would consider [them]self to be in custody and a law enforcement officer’s questioning is likely to elicit incriminating responses." If video recording is used, the camera should record both the interrogator and the person being interrogated. Police officers should wear body worn cameras with applicable privacy protections including creating protocols that require that cameras remain activated and guard against the tampering of footage. Lawmakers should renew our commitment to international human rights; eliminate unworkable collaborations between local law enforcement and immigration authorities; and protect the human rights of families and children who migrate. Congress should adopt and implement the Stop Militarizing Law Enforcement Act of 2015, H.R. 1232, which has been introduced to the House and prohibits the transfer of military equipment that is not suitable for law enforcement purposes by the Department of Defense. The Department of Justice (DOJ) should require that law enforcement agencies provide disaggregated demographic data on police interactions with individuals and communities in all funding applications, including data on searches, stops, frisks, searches, summonses, tickets, arrests, and complaints. The National Initiative for Building Community Trust and Justice is working on interventions in six communities (Stockton, CA, Pittsburgh, PA, Minneapolis, MN, Gary, IN, Fort Worth, TX, and Birmingham, AL) to address implicit bias, and promote procedural justice and reconciliation. Representation Gwen Moore introduced The Preventing Tragedies Between Police and Communities Act of 2016, H.R. 5221, to the U.S. House of Representatives. It would require police departments that receive certain federal funds to institute de-escalation training. While ultimately unsuccessful, the Committee for Professional Policing in Minneapolis attempted to place a ballot measure that would require police to purchase personal insurance for misconduct. This unique approach combines insurance and ballot initiatives as possible alternatives for reforming policing. Social justice leaders should consider incorporating more direct attacks on the actual effectiveness of “broken windows” approaches to policing. In reviewing 30 studies evaluating policing practices, Harvard criminologist Anthony Braga and his co-authors found that policing practices that are aggressive and intrusive, such as stop and frisk, do not reduce crime. Instead, practices that focus on problem-solving and improving the conditions of communities showed some impact on reducing crime. A central goal of any community is the safety and security of its members. Police can and should play an important role in achieving this goal. To do this, police must work within the community with mutual trust and respect, and strive for positive community relationships. But, like many aspects of our current criminal justice system, the role of law enforcement has been overemphasized, overfunded, and outsized to proportions that no longer serve the goal of community safety and security. We need to take a close look at the factors that really cause communities to feel safe and identify what’s working and what’s not. One thing that’s not working is the adoption of military-like practices that treat community members as enemies and enforces a war-like mentality that none of our communities want to live with. Police should aim to eliminate the harms of an unnecessarily militarized police force, and departments should eliminate militarized tactics that decrease their legitimacy in the communities they serve. Congress can do its part as well by severely limiting the transfer and use of military equipment to local law enforcement and creating a mechanism for investigating complaints and issuing sanctions regarding inappropriate use of equipment and tactics during mass demonstrations. Call your member of Congress and urge them to adopt and implement the Stop Militarizing Law Enforcement Act of 2015, H.R. 1232, which has been introduced to the House and prohibits the transfer of military equipment that is not suitable for law enforcement purposes by the Department of Defense. Justin Hansford and Meena Jagannath’s article, Ferguson to Geneva: Using the Human Rights Framework to Push Forward a Vision for Racial Justice in the United States After Ferguson, in which they describe bringing a complaint against the United States before the Committee Against Torture for the events in Ferguson. Our former Communications Fellow Johnny Perez is on The New York Advisory Committee to the U.S. Commission on Civil Rights, which investigates violations of federal civil rights laws including abusive police practices.